This article was updated on 08/27/18. The second in the DIY concrete slab series, this article explains finishing the slab by the steps of screeding, darby, edging, grooving, floating, and troweling the slab. The first article covered building the concrete form and pouring the concrete. 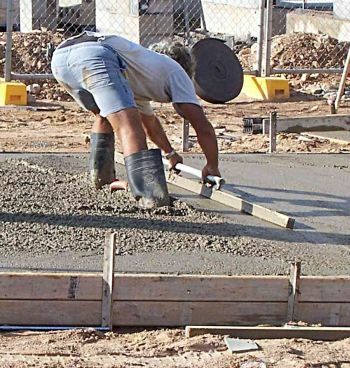 The term slab is used in this article for any concrete pour for the sake of convenience. Finishing a concrete slab is a DIY project that requires patience and a bit of practice However, if done properly, concrete finishing has an orderly and predictable outcome. If a home is to be framed on the slab, a smooth level finish is desired. This is even more true when building a concrete countertop. For this and other types of projects, there are specialized concrete mixtures available. Always be aware that there is a limited concrete working window to work the poured concrete slab, whether it is a porch step or a large patio. As soon as the concrete begins to dry, the wheels have been set in motion, and the DIYer must work within these constraints. The first thing to do following the concrete pour into the form is the screed step This is also known as the strikeoff. Do this with a straight, unbowed, 2 X 4 board or aluminum screed. Why is this step done? To level the wet concrete with the top of the form. It forces the bigger aggregate, which is gravel, towards the surface. The board should overlap the concrete form 6 on both sides for effective working area. Begin at one end. Use a sawing motion on the top of the form to level out the concrete, back and forth, to the opposite end of the concrete form. Now the darby comes into play. 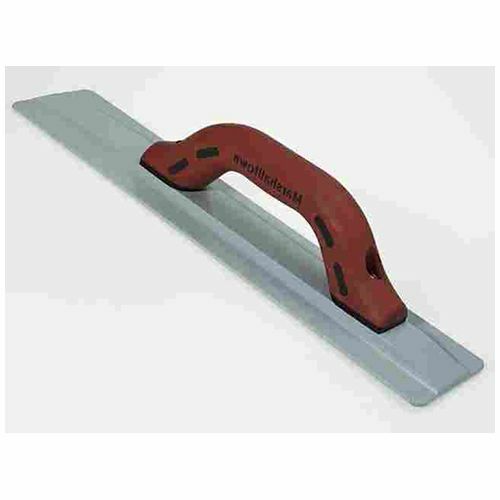 A darby is a tool that smooths the surface of the concrete. Use smooth, overlapping arcs. Push down while smoothing to remove lumps while filling any low spots. Larger projects such as a driveway should be done with a bull float. Next, water will begin to appear on top of the slab. Wait while the water reabsorbs into the slab. When a thumb pressed into the slabs surface leaves a quarter of an inch inch impression its time to edge the concrete slab. Now run the edging tool around the top edge of the slab. This rounds off the edge. Why is this important? It prevents the edge from chipping after the concrete dries. Next use the grooving tool on the cement surface every 10 to 12 feet using a straightedge to guide the groover. Youll trowel over the surface of these grooves in the next step but theyll still be there beneath the surface. The slab will be subjected to many forces over its lifespan. The groove provides the concrete slab with a vertical plane to crack if it must. Next, float the concrete slab. This is done using a special magnesium float. This step takes the smoothing one step further. Sweep the float across the slab in large smooth arcs. How much pressure is applied? This is where concrete finishing becomes an art. It depends on the hardness of the concrete slab at this point. And finally, begin to trowel the slab with a steel trowel. This is like floating but its objective is to take the concrete slab to more precise levels of smoothness. Further successive passes yield more precise results. Trowel it the first time, let it dry more, and trowel it another time. Under most circumstances, three passes will yield the best results. Let the concrete slab dry completely and then remove the form and discard the lumber.